Looks like I had this one pegged. After reading the Washington Post interview with Joe Paterno, we learned more of Joe's thought process and how it all went down, and it reminded me of what I wrote back in November. You may not feel any differently about the outcome or what you believe Paterno was or was not responsible for, but I always find it beneficial to think about things as they actually happen on the ground. We all benefit from hindsight. 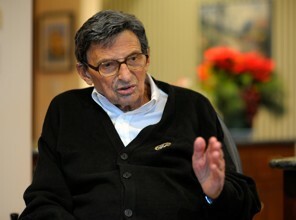 Paterno says as much in the Washington Post article. Knowing what he knows now, he wishes that he had done more. I think we probably all have something in our past where we could relate to that. But in the moment, at the time, you were doing what you thought was best. That's what I think Joe did. He did the best that he knew to do at the time. Unfortunately the media, the public, and the Penn State board were all able to judge with hindsight. Perhaps Joe should have done more. I know it's not possible to do, but if they could have judged him more on actions in the moment - with the information that he had - maybe things would have turned out different. This is not to say that I think that Joe Pa is the most damaged victim in this situation. Obviously that is the kids who were molested by a perverse individual. But I don't know enough about what that does to a person to speak intelligently, so I can only think from the perspective of someone who had something taken from them despite doing the best that they knew to do. Joe's interview and situation is a sad one. The all-time winningest college football coach being treated for lung cancer, his energy faded, and his passion - Penn State football - has been taken away. It wasn't supposed to end like this.